Atsuko Kawakami was born in Hokkaido in a town called Otofuke, and she studied music under Michiko Endo (Sapporo) and Chiharu Taguchi (Tokyo). She studied economics at Yokohama National University, then Kawakami went to England to study the piano under Benjamin Kaplan. She devoted five and a half years to her studies, and returned to Japan soon after. In 2001, she made her debut in Japan when she played Transcendental Études 1837 Ver. composed by Liszt that was thought to be impossible to play. Critics raved in the Present Music Magazine, “a pianist of extraordinary talent. A glamorous performance filled with liveliness”. In 2003, she played the Japanese Suite composed by Akira Ifukube, who was in attendance and was astounded by her performance. In May of 2004, she was given the composition, “Japanese Rhapsody” also composed by Ifukube, and was able to perform it in a solo concert he was present in. 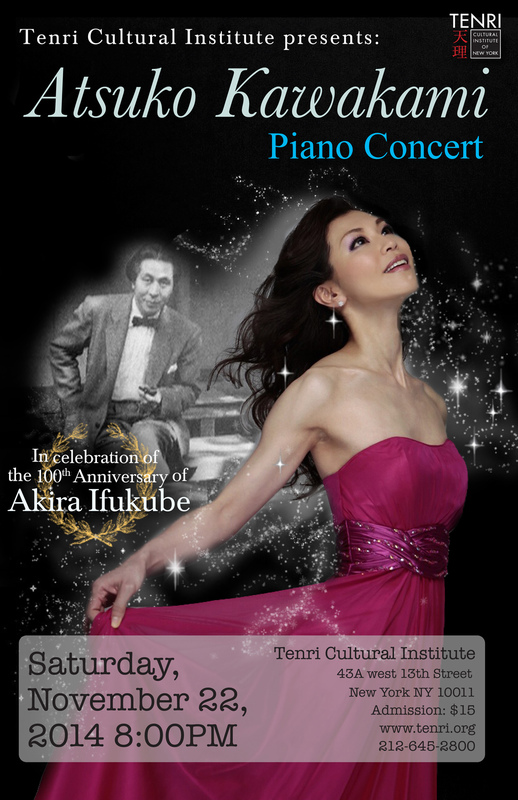 In September of 2012, she released the album, “Akira Ifukube Works for Piano”, which was selected as the editors choice in Recording Arts Magazine. Other major performances worth mentioning is the artists’ non pedal rendition of Mozart’s works for piano sonata (“the clarity of each key tone played was amazing, and she has brilliant finger technique. She was able to logically convey the beauty of Mozarts’ piano pieces.” --Chopin magazine), and also played “Ritmica Ostinata” composed by Akira Ifukube, together with the Sapporo Symphony Orchestra. Akira Ifukube was born May 31, 1914 on the northern Japanese island of Hokkaido. Ifukube began writing original compositions at the age of 18. In 1933 he wrote his first published work, Piano Suite. In 1935 Ifukube's career as a composer took a huge step forward when his first orchestral work, Japanese Rhapsody (1935), won the Tcherepnin Prize at a competition in Paris. In 1946 Ifukube accepted a teaching position at the Tokyo National University of Fine Arts and Music. Shortly thereafter Ifukube was engaged by Toho, Japan's leading film studio, to write music for films. In 1954 Ifukube wrote the famous score for the giant monster film Gojira (Godzilla). Ifukube went on to be prolific in this medium; he composed roughly 300 film scores. (near the New School and Parsons School of Design). F, V and L trains stop at 14th St. and 6th Ave.
1, 2, and 3 trains stop at 14th St. and 7th Ave.
N, Q, R, W, 4, 5, and 6 trains stop at 14th St.-Union Square station.